Loretta Castorini: That was so awful. Loretta Castorini: Beautiful… sad. She died! she was gonna die. I knew she was sick. Ronny Cammareri: She had TB. and still she had to keep singing! Oh do I love this spaghetti, simple, plain, satisfying, and easily can transport one to Rome on a dreary day in NC… simple ingredients and a quick preparation transforms this into a “stuff my face” pasta dinner by the fire or better yet while watching “Moonstruck”, perrrrfect. The picture is of my bowl of spaghetti…more pepper of course. My fricos are normally served with salads or soups, but I chose not to make a salad at the last-minute and the frico became Mikey’s new bowl for his otherwise plain pasta cacio y pepe yet another cheesy recipe from my quick dinner book. My now preferred bowl for Cacio y Pepe, then I find that Anthony Bourdain mentions this dish on one of his shows (can’t hardly think beyond his old “Kitchen Confidential” book so I bypassed the info and made my own version which is not at all unlike the recipe that someone else posted. Michael was still talking about the little crispy bowl this morning good thing I order my Parmigiano by the 5 lbs, but this will not be on every menu in the future. To a hot sauté pan add 1 cup boiling pasta water, the butter, and the pepper. Toss the pasta into the pan turning and tossing until just about all of the water is absorbed, remove from heat add the cheese and stir into coat all the spaghetti. Pour some kosher salt on a plate. 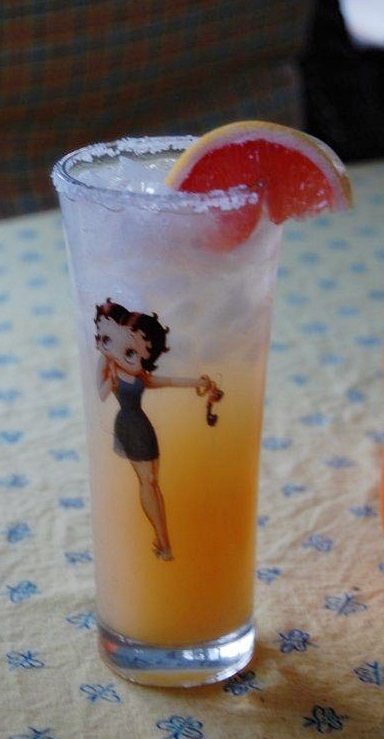 Rub half of rim of a highball glass with a grapefruit wedge; dip rim of glass in salt. Combine 1/4 cup fresh grapefruit juice, 1 tablespoon fresh lime juice, and 1 teaspoon sugar in glass; stir until sugar is dissolved. Stir in 1/4 cup mescal or tequila, add ice, and top off with 1/4 cup club soda. Garnish with grapefruit wedge.